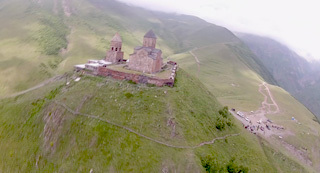 One day Tbilisi to Kazbegi round tour via Jvari, Ananuri, Jinvali Lake, Pasanauri, Gudauri, Friendship Panorama Monument and Gergeti Church with offroad tour for paragliding from highest takeoff in Gudauri. Paragliding fly time up to 25-30 minutes! - Best choise for your childrens! Cross Country paragliding flight from most safe takeoff, up to 45 min in air! But don�t waste your time by staying still too long. Go on � the higher is the better. The most amazing views are still ahead of you. After climbing a steep slope we�ll reach a spectacular meadow. Do you think it�s the end of our trip? Not yet! We�re going right to the peak! By the final you�ll know that off-road driving is a very special entertainment � surely not for wimps. But you�ll bet that the efforts were worth it. You�re on the top of the world! And from there on you�re going to fly down like a bird. Your pilot has already prepared the paraglider. Short briefing, and it�s time to take off! To start flying, you�ll need to make a few steps or short run to get some acceleration. One, two, three� and you�re up in the sky! There are no words to describe what is flying. You need to feel it. Especially when it comes to flying in high mountains� There is no other experience like this! Just imagine: astonishing nature. Unlimited landscapes. And total freedom that only flight can give. So, if you want thrills, lively emotions and crazy photos, the off-road tour with Fly Caucasus is what you need! Warning! Don�t forget that it�s going to be cool in the mountains, make sure that you have warm clothes! One-day tour from the capital city Tbilisi to the snow-cowered peak of the Mount Kazbek will open you up enchanting Georgia. 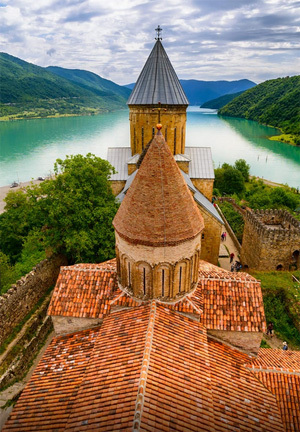 On the way there you will visit a bewitching Ananuri complex located at the quiet waters of the Jinvali Lake, see the beauty of mountainous rivers and gorges of Kazbek, and enjoy the tranquility in the Gergeti church, which is the final destination of the journey. There you will get an amazing view on the village of Kazbegi and grand Mount Kazbek. At 7 to 9am our driver and guide will pick you up at your hotel in Tbilisi. The route will take over the Georgian Military Highway up North towards the border with Russia. Your first stop will be at Ananuri complex, a former residence of Argveti Dukes. The complex of the churches and towers dating back to the XVI-XVII cc. beautifully overlooks Jinvali reservoir. We�ll continue our drive to see the conjunction of two small mountain rivers famous for the fact that being different in color they still keep their own shades even after they merge. 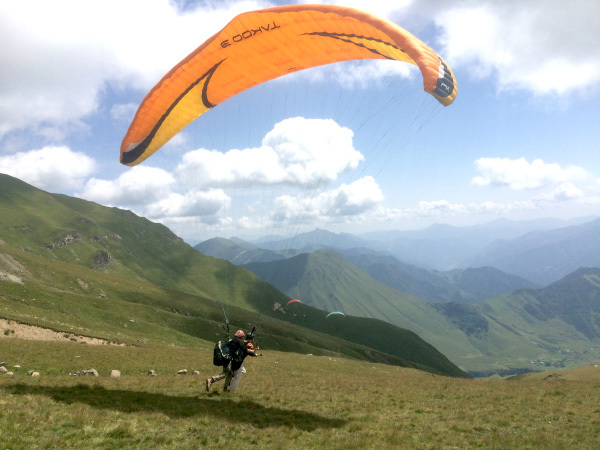 Near 9-11 am you'll meet your paragliding instructors and join the 4x4 jeep tour to your takeoff spot for your first time paragliding experience in Caucasus or Ananuri. Then we will drive over the Cross pass, and make a short stop at Soviet time People�s Friendship mountain view point overlooking a deep gorge of Caucasus mountain range. In Kazbegi you will enjoy breathtaking views of the same name mountain. And that�s the final point from which we will take you back right to your hotel in Tbilisi. Enjoy your impressions!